Honda’s new model, set to launch this winter, provides quite the Fit-ting style for a small SUV. 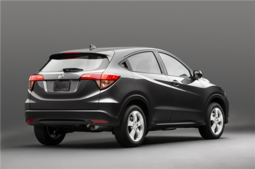 The 2015 Honda HR-V is based on the redesigned 2015 Honda Fit model, but with more room and cargo space than the subcompact hatchback. The HR-V is also smaller than a traditional compact crossover, making it the perfect size for those that wish to drive in the city, and even on mountain roads. Produced at Honda’s North American manufacturing facility in Celaya, Mexico, the all-new HR-V compact SUV is a sleek-looking vehicle with expressive character lines, a nice, slightly U-shaped grille, and headlights that give off the impression that the vehicle is observant. The added detail of hidden rear door handles also give the 2015 HR-V a coupe-like presence. Overall it has an urban-style design. The SUV is actually built on the same Global Compact Series platform that underpins the new-generation Fit hatchback, with a unique centre tank layout, allowing the vehicle to provide a spacious and versatile interior. The automaker has also said that its new HR-V delivers something of a go-anywhere-and-back versatility, so we imagine that Honda’s focus on this small SUV is really versatility and spaciousness, all wrapped in a stylish package. It is a good thing then, that Honda has decided to include its popular Magic Seat in the 2015 HR-V. For consumers that are not quite sure what this means, we can assure you that this is a feature you want to have included in your vehicle. Honda’s exclusive Magic Seat allows for multiple seating configurations. Taking the newly redesigned Fit as an example, the automaker describes four different seating modes for practically any situation: Tall, Utility, Long and Refresh. The first mode will allow buyers to fold the second-row seats with a 60-40 split, but in such a way that owners can fit their items in an upright position. With Utility mode, drivers can split and fold the seats down, which increases cargo space. As for the third mode, long and somewhat awkward-fitting items are more easily placed in the SUV, and finally Refresh mode provides consumers with the ability to take off the front headrests, and fold back the front seats for pure relaxation. 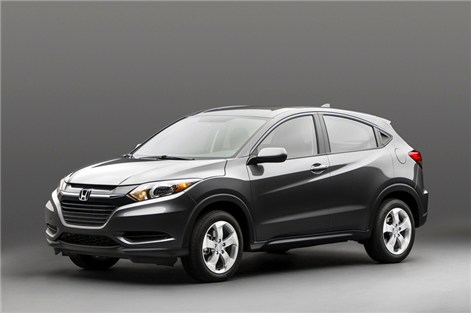 The 2015 Honda HR-V serves as the entry point to the automaker’s light truck lineup, and although details regarding the specifications have not been released, we know that it is based on the new Fit hatchback, which is equipped with a more efficient and powerful 1.5-litre direct-injection 4-cylinder engine compared to the previous model, and will be available with a 6-speed manual transmission, and a new Continuously Variable Transmission (CVT). It is yet to be seen if the 2015 HR-V will include similar equipment. Honda has also received the 2014 Brand Image Award for Best Overall Brand in the mainstream category by Kelley Blue Book (we have the Canadian Black Book here). 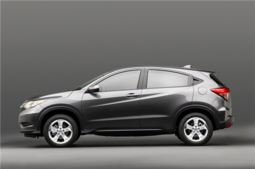 The automaker’s vehicles in general are also known for their good value and reliability, and we expect the same thing from the new 2015 Honda HR-V.
For more information on the upcoming small SUV, contact us today – or visit us at Lallier Honda Montreal!